When Hurricane Ivan passed over the small Caribbean island of Grenada on the 7th of September 2004, between the hours of 2:00pm and 7:00pm, its torrential rains and 135mph winds left unprecedented devastation in their wake. As luck would have it, the eye of the storm passed close to the southern tip of the island, which is the most densely populated area and which includes the capital, St. George’s. In those five hours, 89% of the country’s housing stock was damaged, most hospitals and schools were wrecked, telephone lines downed, running water supplies cut off, 18,000 people were left homeless, 700 were injured and 39 died. The cost of the damage amounted to US$1.1 billion, which is more than twice the country’s annual GDP. In St. George’s, every major public building was either severely damaged or destroyed. Among the public buildings most severely damaged was St. George’s 17th-century Richmond Hill Prison, which sits atop a picturesque, 550-feet hill, directly above the Prime Minister’s Office, which is half-way down the hillside. When the prison’s roof blew off, all the prisoners escaped and many of them ran directly downhill to the Prime Minister’s Office – an event which, to this day, provides the stoic Grenadians with an endless supply of jokes, most of them to do with the quality of the occupants of the lower building. The brunt of the gale-force winds was borne by the three tallest building in St. George’s – its churches: St. Andrew’s Presbyterian Church, St. George’s Anglican Church and the Catholic Cathedral of the Immaculate Conception. As they are all located in the highest part of the city, on top of a hill overlooking the port, all three were destroyed. 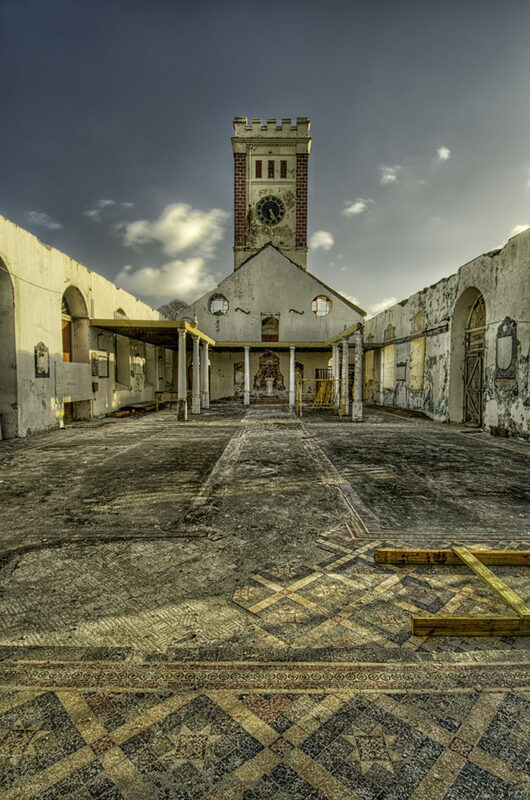 When I visited Grenada recently, only the Catholic cathedral had been rebuilt. 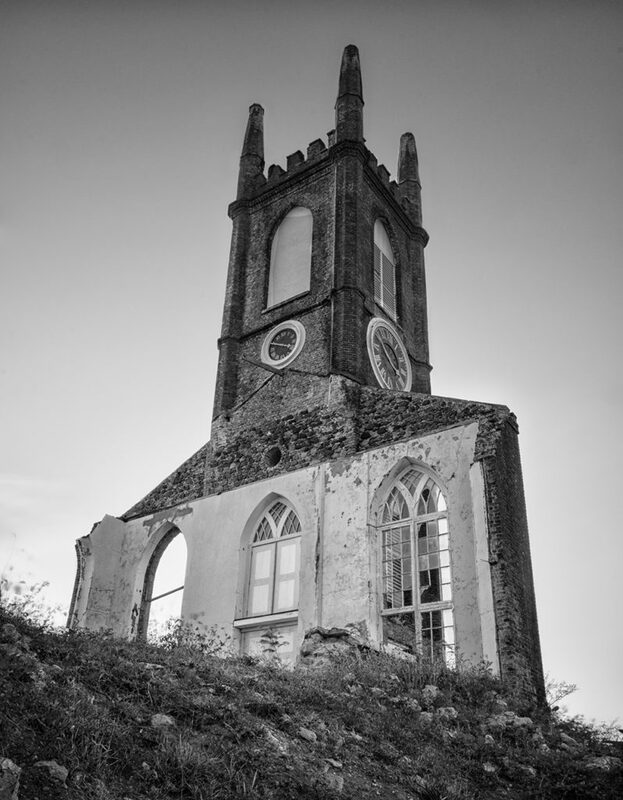 As 64% of Grenada’s population of 100,000 people are Catholic, I surmise that the cathedral has found it easier to raise the funds necessary to rebuild, by comparison with the Anglican (22%) and Presbyterian (less than 1%) churches. Locals told me that reconstruction work on St. Andrew’s Presbyterian Church started about five years ago but has since stalled due to lack of funding. All that is left of the church now is a single end-wall and clock tower (lead image), the clock’s hands stopped at 3:50pm, a little under two hours into the hurricane’s onslaught. At St. George’s Anglican Church (all other images), the four walls remain standing but the roof is gone and the building’s stained glass windows have been blown out. 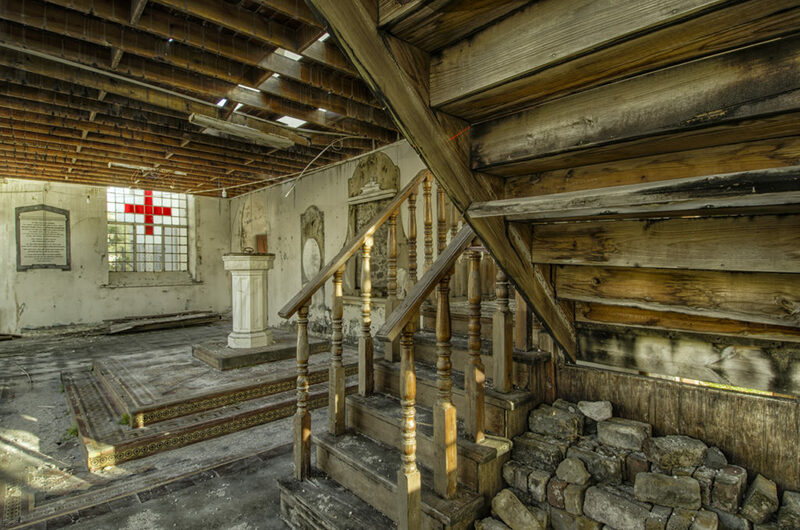 Inside, a baptismal font (second and fourth images) stands next to the wrecked wooden staircase which parishioners used to climb to the reach upstairs gallery, long since disappeared. A few wooden pews remain in place but all are damaged and strewn with construction materials. In the grounds, by the church’s iron railing, a sign appeals for donations to the church’s reconstruction fund. The amount sought is a modest $2.0 million Eastern Caribbean Dollars (about US$735,000). This struck me as being not a very high price to pay to rebuild the hopes of the island’s Anglican parishioners. While I am not a religious person, I found there to be a poignant sense of loss in these two destroyed sacred buildings. Eleven years after their destruction, there remains little prospect of their being rebuilt. 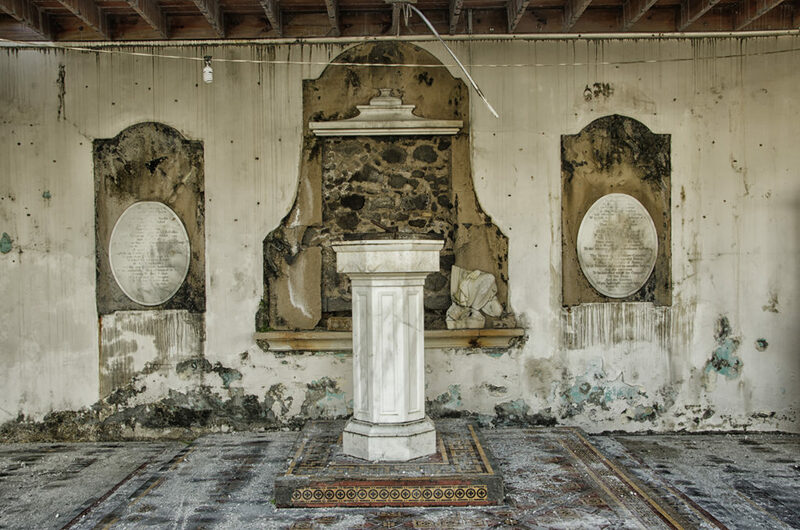 I stood there and wondered how Grenada’s Anglican and Presbyterian faithful squared it with themselves that the God in whom they believe had seen to destroy the magnificent monuments they had built to honour him and that, as yet, he doesn’t seem to have intervened to help them rebuild. Scheduled to fly out of Beijing at 6:30 on a Saturday evening, I knew I had the best part of a day to get out and take some photos. So, I headed out from my hotel in the Central Business District at 7:00am and took the metro from Guomao to Nanluoguxiang, then walked to Houhai Lake, which is at the centre of Beijing’s hutong area. The Beijing metro is one of the most impressive I’ve been on: clean, modern, fast and cheap: just 4 Yuan (about 65 cents) for a one-way journey encompassing eight stops. The trains are all enclosed in glass, so riders can’t fall off the platform. Station names are posted in English, as well as Mandarin, so it’s easy for foreigners to find their way around. I suppose we have the Olympics to thank for that. Whenever I visit cities abroad, I always take the metro to get around, as that’s where you see how the people actually live. I found Beijingers to be friendly and polite, even though the metro was crowded and everyone was preoccupied with going about their Saturday morning business. 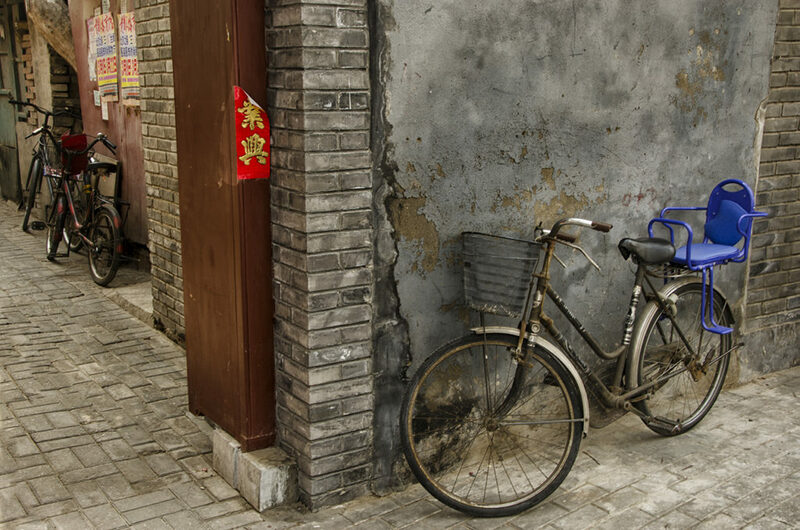 Hutongs are low, narrow alleyways, lined by traditional siheyuan, or courtyard residences, with a walled front and gateway, heavy wooden doors and ornate, slate-covered rooves over the gates. Hutongs were a common form of architecture throughout northern China during the Yuan Dynasty (1271 – 1368) of the Mongolian leader Kublai Khan but most have been swallowed up by China’s rapid industrialization. The few that remain are concentrated around Houhai Lake, just north of the city centre. 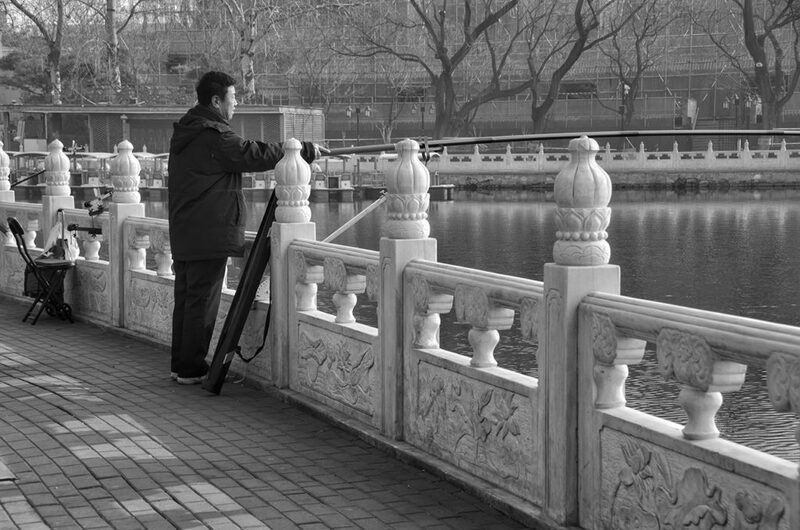 Despite the chill of early morning, I found that Beijingers live life substantially out of doors. 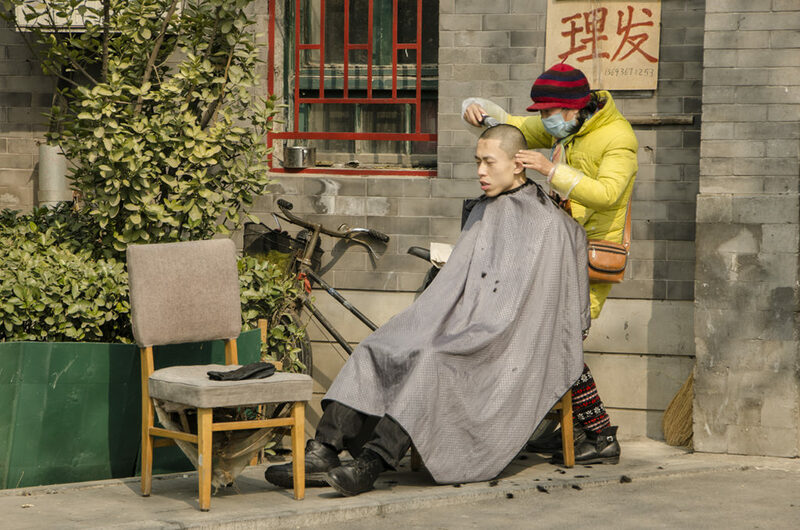 Though the area around the lake was almost deserted when I arrived, it filled up rapidly with people exercising, fishing, mock-fighting, dancing, walking their dogs and even getting their hair cut in the open air. I was surprised by how many dogs there were around. Most of them appeared pampered and as well cared for as their Western counterparts. They certainly didn’t seem to be living in any fear of being eaten. Maybe that’s just another way in which we misunderstand China. 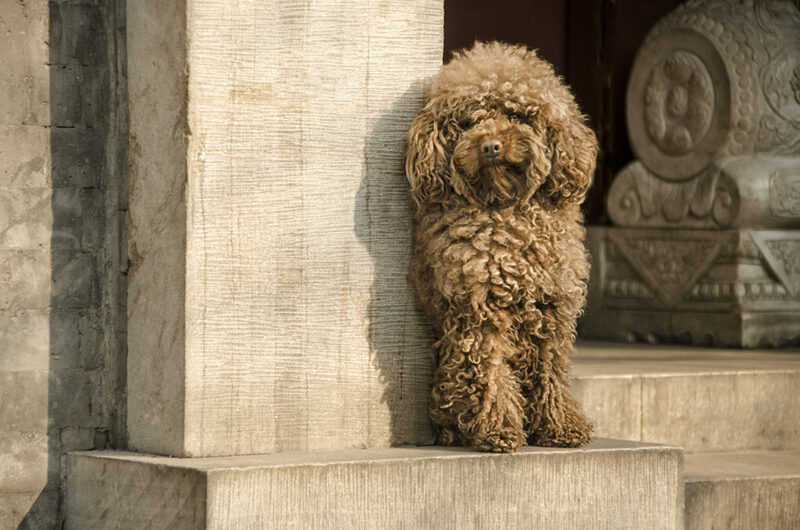 One apparently fearless poodle even posed serenely for me in the doorway of the siheyuan outside which he stood guard. Taking any kind of photo in Beijing is a challenge. The smog that hangs over the city is so severe that it forms a heavy, grey, featureless blanket that envelopes the tops of buildings. One never sees cloud formations. Nor does one ever sees blue sky, just grey. The sun rises behind a dense veil of haze; for a few moments the grey blanket turns orange, then quickly back to grey again. And it says that way for the rest of the day. While the city at large is overrun by cars, around Huohai Lake I was encouraged to see lots of bicycles. They made me think back to those early images of the China that Richard Nixon visited in 1972, to the black and white film of thousands upon thousands of Chinese, uniformly dressed in Mao suits, riding their heavy, black bicycles. Looking at the sky over Beijing on Saturday morning, I couldn’t help but think that they might have been better off had they stuck with their bicycles.